Pares, often called beef pares, is a braised beef dish that originated in the Philippines. Literally meaning "pair", this dish is a combination of a beef stew viand and a light beef broth soup, both served with rice. Some less popular variations of the dish are rice-topping versions. 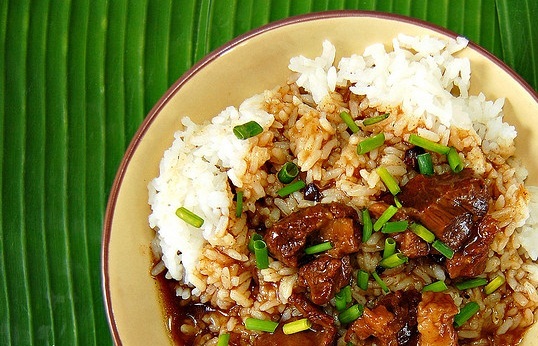 The stew is made with beef cutlets cooked in sweet soy sauce and anise, topped with spring onions. Very tender beef and a sweet seasoned sauce are the distinguishing characteristics of this dish. The soup is made by combining a portion of the stew sauce with some pre-cooked soup stock. 1. Combine beef, water and onion, simmer in low fire for 1hr or til tender, add water if necessary (there must be 2 cups stock left when the beef is tender) keep the stock. 2. Heat wok over high heat with oil. Add ginger and garlic. Stir fry for 1 minute. Add beef chunks and continue to stir fry for 2 to 2 1/2 minutes on high heat. 3. Put the stock and add the remaining ingredients and simmer again for 15mins. Add the cornstarch, stir until sauce thickens. remove from heat.